Shutters can create a subtle style difference for your home. We offer traditional open-louvered or classic raised-panel shutters. Our shutters are available in a wide array of attractive colors to complement any decor. 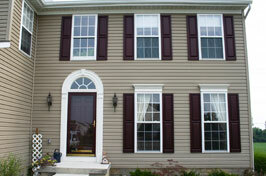 Our shutters are made of a durable co-polymer for lasting quality and unparalleled beauty. Make sure your home puts forth the best look for all who see it, and ask us about our quality shutters today.